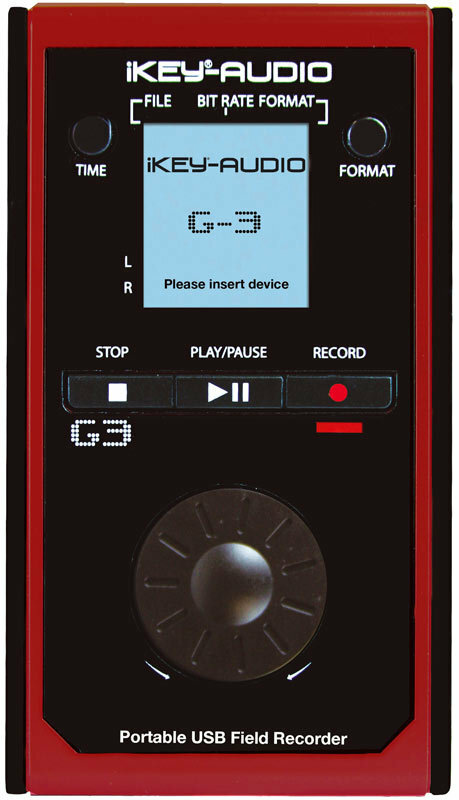 g3, Pocket Recorder/Multitrack from iKEY-audio. iKEY Audio announced the availability of the G3 Portable Guitar/Instrument Recorder, for documentation of jam sessions, practice sessions, and compositional ideas. This pocket-size unit allows recording through a 1/4" input with any line level source - guitar, bass, electronic keyboard, or off a mixing board or any mono or stereo line output. The G3 records directly to inexpensive and reusable SD or SDHC cards (32GB maximum; a 1GB card is included with the unit). 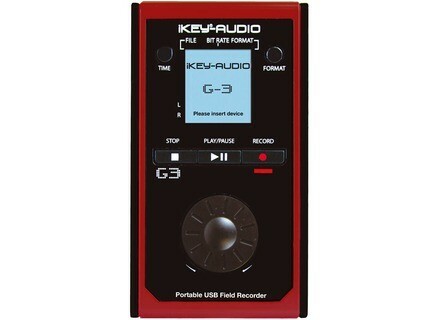 The G3 can record CD-compatible 16-bit, 44.1kHz WAV files, or MP3 files of 128, 256, and 320Kbps. It has a 1/4” stereo headphone/line output for monitoring. The INPUT GAIN has a 3-level adjustment switch (-20, 0, or +10dB). You can plug your instrument into the G3 and record, passing the signal through to your amp or monitors, or put it at the end of the recording chain; the choice is yours. The G3 allows for MIX recording, which means you can listen to a file you’ve already recorded, play along with it, and record both the previous and current tracks to a new track. So, you can lay down your rhythm track first, and then record a lead over it. You can then easily download the files to your computer via the built-in USB port (Mini-USB cable included). The G3 has a full color LCD screen, with adjustable record level and a digital input VU meter. It has a built-in guitar tuner, so you don’t lose any time connecting any extra gear; and even has a built-in stand mount so it can be affixed to a mic or tripod stand. It runs on (4) AA batteries (included), or optional AC adaptor. The G3 carries a suggested retail price of $199.99. Roland R-05 Recorder Available Roland announced that the R-05 WAV/MP3 Recorder is now shipping. Mackie Onyx-i Series with Waves Live Mackie’s Onyx 1640i is presented as "the ideal mixer to use with Wave’s new MultiRack live plug-in platform." Mackie 2404-VLZ3 & 3204-VLZ3 Mackie announced two new mid-format analog consoles, each featuring dual internal FX processors, dedicated compression and 4-track recording via USB – the 24-channel 2404-VLZ3 and 32-channel 3204-VLZ3.